Women who aren’t really gifted with long, thick, and full eyelashes resort to using everyday mascara or eyelash extensions. After all, makeup and technology have made it much easier to enhance this facial feature, which frames and highlights the natural beauty of your eyes. If you’re keen on using eyelash extensions – which have reigned for decades as a quick lash enhancement fix – here’s a quick guide. In lash extensions, individual lashes are extended with synthetic, single-fiber, polyester thread-like materials. These are attached using surgical-grade and come in various lengths, colors and styles, and levels of thickness. They can be worn while you sleep, shower, or swimming. Avoid too much oil, though, as it can weaken the adhesion. A full lash extension set lasts anywhere from two weeks to two months, depending on the hair growth cycle. 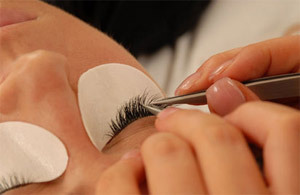 Extensions are different from falsies in that they are applied to each lash, the process taking about 1.5 to two hours for a full 30 to 80 lash set for each eye. Green, purple, red, brown lash extensions – take your pick from the virtually endless array of color choices! Materials like mink are also available, although you have to pay a higher price for the unique, high-quality ones. If you have sensitive skin, the lash glue may cause skin rashes or irritation, and may progress into worse allergic reactions such as redness, watering, and even swelling of eyes. Glue and tweezers come in close contact with your eyes, so make sure to go to a professional beauty technician or salon for your lash extensions. All tools and materials should be clean and sanitized. Extensions worn for painfully long periods of time may accidentally damage your natural eyelashes! If you have weaker hair follicles, you have experience permanent hair loss. If you’re considering the use of eyelash extensions, know that any potential beauty benefit is far outweighed by your safety. Pay to have it done in a recognized beauty center. Explore other options, too, if your natural lashes are too weak to have artificial ones attached onto them. Whether it’s a high-impact mascara or lash lengthening serum you’re using as an alternative, go for premium quality and not just because it comes with an affordable price tag.